Ursula: The men up there don't like a lot of blabber / They think a girl who gossips is a bore / Yes, on land it's much preferred / for ladies not to say a word / After all, dear, what is idle prattle for? / Come on, they're not all that impressed with conversation / True gentlemen avoid it when they can / But they dote and swoon and fawn / On a lady who's withdrawn / It's she who holds her tongue who gets her man. Scuttle: [singing loudly and off-key] Wa wa wa, wa wa! Prince Eric: Wow. Somebody should find that poor animal and put it out of its misery. Sebastian: The newt play the flute / The carp play the harp / The plaice play the bass / And they soundin' sharp / The bass play the brass / The chub play the tub / The fluke is the duke of soul. Sebastian: The ray he can play / The ling's on the strings / The trout's rocking out / The blackfish she sings / The smelt and the sprat / They know where it's at / And oh, that blowfish blow! Ha-ha! 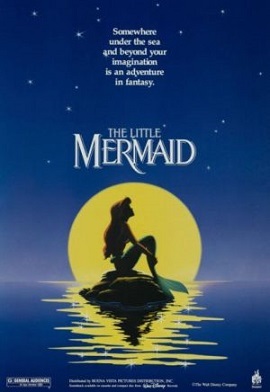 Ariel: Flounder, don't be such a guppy. Flounder: I'm not a guppy. Prince Eric: Isn't this great? The salty sea air, the wind blowing in your face... aaah, the perfect day to be at sea! Grimsby: [leaning over rail] Oh, yes... urp... delightful. Ariel: I love you, Daddy. Prince Eric: [upon first meeting Ariel, after she's signed her soul over to Ursula, lost her voice, been turned into a human, and nearly drowned] Gee, you must have really been through something. Ursula: Now, here's the deal. I will make you a potion that will turn you into a human for three days. Got that? Three days. Now listen, this is important. Before the sun sets on the third day, you've got to get dear ol' princey to fall in love with you. That is, he's got to kiss you. Not just any kiss - the kiss of true love. If he does kiss you before the sun sets on the third day, you'll remain human, permanently, but - if he doesn't, you turn back into a mermaid, and - you belong to me! Ariel: I've never seen a human this close before. Oh... he's very handsome, isn't he? Scuttle: I don't know, he looks kind of hairy and slobbery to me. Scuttle: [breathlessly] I was flyin', I - of course I was flyin' - and I saw that the watch... the witch, was watchin' in a mirror and she was singin' with a stolen set of pipes. Do you hear what I'm tellin' you? Scuttle: The prince... is marryin'... the sea witch... in disguise! Sebastian: Like I always say, Your Majesty, "children have got to be free to lead their own lives." Triton: You always say that, Sebastian? Triton: Well... I guess there's one problem left. Triton: How much I'm going to miss her. Scuttle: It's a dinglehopper. Humans use these little babies... to straighten their hair out. See? Just a little twirl here and a yank there and voila. You've got an aesthetically pleasing configuration of hair that humans go nuts over. Prince Eric: Believe me, Grim, when I find the right girl, I'll know. Without a doubt, it'll just-BAM-hit me. Like lightening. Scuttle: We're out to discover! Sebastian: This has got to be, without a doubt, the single most humiliating day of my life! Sebastian: I hope that you appreciate what I go through for you, young lady! Now, we got to make a plan to get that boy to kiss you. Tomorrow, when he takes you for that ride, you gotta look your best! You gotta bat your eyes, like this. Sebastian: You are hopeless, child. You know that. Completely hopeless. Ariel: [sung] I don't know when/I don't know how/But I know something's starting right now/Watch and you'll see/Some day I'll be/Part of your world. Ursula: [singing] I admit that in the past I've been nasty/They weren't kidding when they called me, well a witch/But you'll find that now-a-days/I've mended all my ways, repented, seen the light and took a switch/true? Yes. And I fortunately know a little magic/It's a talent that I always have possessed, but now dear lately, please don't laugh/I use it on behalf, of the miserable, lonely and depressed! Ursula: [to Flotsam & Jetsam] Pathetic! Ursula: [Continues singing] Poor, unfortunate souls! So sad, so true! This one longing to be thinner, that one wants to get the girl and do I help them? Ursula: Yes, indeed! Now it's happened once or twice/someone couldn't pay the price/and I'm afraid I have to rake them across the coals! Ursula: Yes I have had my share of complaints but on the whole I've been a saint!... to those Poor Unfortunate Sou-uls! Prince Eric: Well, what do you say? Would you like to join me on a tour of my kingdom tomorrow? Grimsby: Wonderful! Now, let's eat before this crab wanders off my plate. Prince Eric: Uh, gee Grim. It's... it's really something! Grimsby: Yes, I commissioned it myself. Scuttle: You see the snarfblatt dates back to pre-hysterical times when humans would sit around and stare at each other all day. Scuttle: got very boring. So they invented this snarfblatt to make fine music, allow me! Ariel: Oh, the concert! Oh my gosh my father's gonna kill me! Flounder: The concert was today? Ursula: [after Ariel makes her vaporize Flotsam and Jetsom] BABIES! My poor little poopsies! Sebastian: Ariel, where are you going? Sebastian: Ariel, what are you doing here with this riffraff? Ariel: I'm going to see Ursula. Sebastian: [gets a shocked look on his face and gasps] Ariel, no! No! Sebastian: She's a demon! She's a monster! Ariel: Why don't you go tell my father? You're good at that! Andrina: Ariel, dear, time to come out. You've been in there all morning. Atina: What is with her lately? Atina: Oh, she's got it bad. Triton: What? What has she got? Andrina: Isn't it obvious, Daddy? Ariel's in love. Sebastian: Jeez, man, I'm surrounded by amateurs. You want something done, you've got to do it yourself. Sebastian: First, we've to create the mood. Sebastian: Percussion. Strings. Winds. Words. Sebastian: There you see her / Sitting there across the way / She don't got a lot to say / But there's something about her / And you don't know why / But you're dying to try / You wanna kiss the girl. Grimsby: Eric?... If I may say... far better than any dream girl is one of flesh and blood. One warm, and caring, and right before your eyes. Flotsam & Jetsam: Poor child. Poor, sweet child. She has a very serious problem. If only there was something we could do. But there is something. Flotsam & Jetsam: Don't be scared. We represent someone who can help you. Someone who can make all your dreams come true. Just imagine... You and your Prince... together... forever. Flotsam & Jetsam: Ursula has great powers. Ariel: The sea witch? Why, that's-I couldn't possibly-no! Get out of here! Leave me alone! Flotsam & Jetsam: Suit yourself. It was only a suggestion. Ariel: [looking at the face] Wait. Sebastian: Ariel, you're under a lot of pressure down here. Come with me, I'll take you home and get you something warm to drink. Ursula: That's right. But - you'll have your man. Life's full of tough choices, innit? Ariel: [regarding King Triton, as Sebastian watches, unobserved] If only I could make him understand. I just don't see things the way he does. I just don't see how a world that makes such wonderful things could be bad. Ariel: Look at this stuff, isn't it neat? / Wouldn't ya think my collection's complete / Wouldn't you think I'm the girl / Girl who has everything / Look at this trove, treasures untold / How many wonders can one cavern hold? / Looking around you'd think / Sure, she's got everything / I've got gadgets and gizmos aplenty / I have whoozits and whatzis galore / You want thingamabobs? I've got twenty / But who cares? No big deal / I want more. Triton: I just don't know what we're going to do with you, young lady. Sebastian: Careless and reckless behavior! Sebastian: Well, it was ruined! That's all, completely destroyed! This concert was to be the pinnacle of my distinguished career. Now thanks to you, I am the laughingstock of the entire kingdom! Triton: Seagull? What? Oh - you went up to the surface again, didn't you? Didn't you?! Triton: Ariel, How many times must we go through this? You could've been seen by one of those barbarians - by - by one of those humans! Triton: They're dangerous; do you think I would want to see my youngest daughter snared by some fish eater's hook? Ariel: I'm sixteen years old - I'm not a child anymore...! Triton: Don't you take that tone of voice with me, young lady. As long as you live under my ocean, you'll obey my rules! Triton: Not another word! And I am never, never to hear of you going to the surface again. Is that clear? Triton: Sebastian, I'm concerned about Ariel. Have you noticed she's been acting peculiar lately? Triton: You know, mooning about, daydreaming, singing to herself. You haven't noticed, hmm? Triton: I know you've been keeping something from me. Sebastian: [Stops his knees from shaking] Ariel? Triton: Humans? What about humans? Sebastian: Who said anything about humans? Triton: I consider myself a reasonable merman. I set certain rules, and I expect those rules to be obeyed. Triton: Is it true you rescued a human from drowning? Triton: Contact between the human world and the mer world is strictly forbidden. Ariel, you know that! Everyone knows that. Ariel: He would have died. Triton: One less human to worry about! Ariel: You don't even know him. Triton: No! Have you lost your senses completely? He's a human, you're a mermaid! Triton: So help me, Ariel, I am going to get through to you; and if this is the only way, so be it! Scuttle: [Looking through the wrong end of a telescope, shouting as if Ariel was far away] Whoa! Mermaid off the port bow! Ariel! How you doin', kid? Scuttle: Whoa, what a swim. Scuttle: I haven't seen this in years, this is wonderful! Triton: I'm really looking forward to this performance, Sebastian. Sebastian: Your Majesty. This will be the finest concert I have ever conducted. Your daughters, they will be spectacular! Triton: Yes, and especially my little Ariel. Sebastian: Yes, yes. She has the most beautiful voice. Hmm? Sebastian: If only she'd show up for rehearsals once in a while. Triton: Do you... think - I was too hard on her? Sebastian: Definitely not! Why, if Ariel was my daughter, I'd show her who was boss. None of this flitting to the surface and other such nonsense. No, sir! I'd keep her under tight control. Triton: You're absolutely right, Sebastian. Triton: Ariel needs constant supervision. Triton: Someone to watch over her, to keep her out of trouble. Triton: And you are just the crab to do it. Ariel: You're not getting cold fins now, are you? Ariel: Is he - dead? Scuttle: [Opens Eric's eyelid] It's hard to say. Scuttle: Oh, I - I can't make out a heartbeat. Sebastian: Ariel, listen to me. The human world is a mess. Life under the sea is better than anything they got up there. Sebastian: The seaweed is always greener / In somebody else's lake / You dream about going up there / But that is a big mistake / Just look at the world around you / Right here on the ocean floor / Such wonderful things around you / What more is you lookin' for? / Under the sea / Under the sea / Darlin', it's better / Down where it's wetter / Take it from me / Up on the shore they work all day / Out in the sun they slave away / While we devotin' / Full time to floating / Under the sea! Ariel: It looks just like him. It even has his eyes. "Why, Eric, run away with you? This is all so - so sudden... "
Sebastian: Somebody's got to nail that girl's fins to the floor. Sebastian: Just look at her! On legs! On human legs! Sebastian: just be... just be miserable for the rest of your life. Sebastian: Alright, alright, I'll try to help you find that prince. Sebastian: Boy. What a softshell I'm turning out to be. Louis: [singing] Les... pois... sons, les poissons / How I love les poissons / Love to chop and to serve little fish / First I cut off their heads, then I pull out their bones / Ah, mais oui ça c'est toujours delish / Les poissons, les poissons, Hee-hee-hee, ho-ho-ho! / With the cleaver I hack them in two / I pull out what's inside, and I serve it up fried / 'Cause I love little fishes, don't you? / Here's something for tempting the palate / Prepared in the classic technique / First you pound the fish flat with the mallet / Then you slash through the skin, give the belly a slice / Then you rub some salt in, 'cause that makes it taste nice! Louis: Zut alors! I have missed one. Louis: Sacrebleu! What is this? / How on earth could I miss / Such a sweet, little succulent crab / Quel dommage, what a loss! / Here we go, in the sauce / Now some flour, I think just a dab / Now I'll stuff you with bread! / It don't hurt, 'cause you're dead / And you're certainly lucky you are / 'Cause it's gonna be hot in my big silver pot / Toodle-oo, mon poisson, au revoir! Scuttle: Well, look at what the catfish dragged in! Scuttle: Look at ya! Look at ya! There's something different. Don't tell me. I got it. It's your hairdo, right? You've been using the dinglehopper, right? Sebastian: She's got legs, you idiot! She traded her voice to the sea witch and got legs! Geez, mon! Flounder: Ariel's been turned into a human. She'll have to make the prince fall in love with her, and she's gotta-she's gotta kiss her. Sebastian: And she's only got three days! Triton: Any sign of them? Seahorse: No, Your Majesty. We searched everywhere. We've found no trace of your daughter or Sebastian. Triton: Well, keep looking. Leave no shell unturned, no coral unexplored, and let no one in this kingdom sleep until she's safe at home. Seahorse: [bows his head] Yes, sire. Triton: [in shame] Oh, what have I done? What have I done? Prince Eric: You know, I feel really bad not knowing your name. Maybe I can guess. Is it, uh... Mildred? Prince Eric: Okay, no. How about Diana? Rachel? Sebastian: [Whispering] Ariel. Her name's Ariel. Prince Eric: Ariel? Oh. That's kind of pretty. Okay, Ariel. Ursula: [watching Flotsam and Jetsam knock the boat with Ariel and Eric in it about to kiss] Nice work boys. That was a close one... too close! The little tramp! Ursula: Well, it's time Ursula took matters into her own tentacles. Ursula: Triton's daughter will be mine!... and then I'll make him writhe. I'll see him wriggle like a worm on a hook! Ariel: [after Rescuing the Prince] Is he dead? Scuttle: It's hard to say? Sebastian: [after watching the unfolding events] We just gonna forget the whole thing ever happened. The Sea King will never know. You won't tell him. Flounder: [Nods in agreement] Sebastian: I won't tell him. I will stay in one piece.